Not long ago, I had a brave moment and decided to try crocheting. I got pictures to look at and lots of tips from family and friends. I already had some beautiful reddish yarn and a crochet hook. I made the chain and then dug in. I did it! Yay! I got to the end of the first row and added another row . . . and another . . . and another. “This isn’t so hard,” I congratulated myself. Then I spread it all out and looked at what I’d made so far. Instead of a rectangle, it was an arch! Oops! I guess I added a stitch or two on every new row! But since it was my first try, AND I love the yarn, AND it looked pretty even in its wonkiness, AND it reminded me of the red soil on the farm where I grew up, I decided to make something out of it. The picture slowly grew in my mind: a red hill covered in grass and wildflowers with a bright blue sky and bright yellow sun. So I dug through my remnants and . . .
inserted a 12-inch pillow form. I love the things you create but more than that, I love the way you take something that may not have turned out the best and create something of value. Great attitude. Thanks for sharing. It’s contagious. What a beautiful (and lucky) save!! 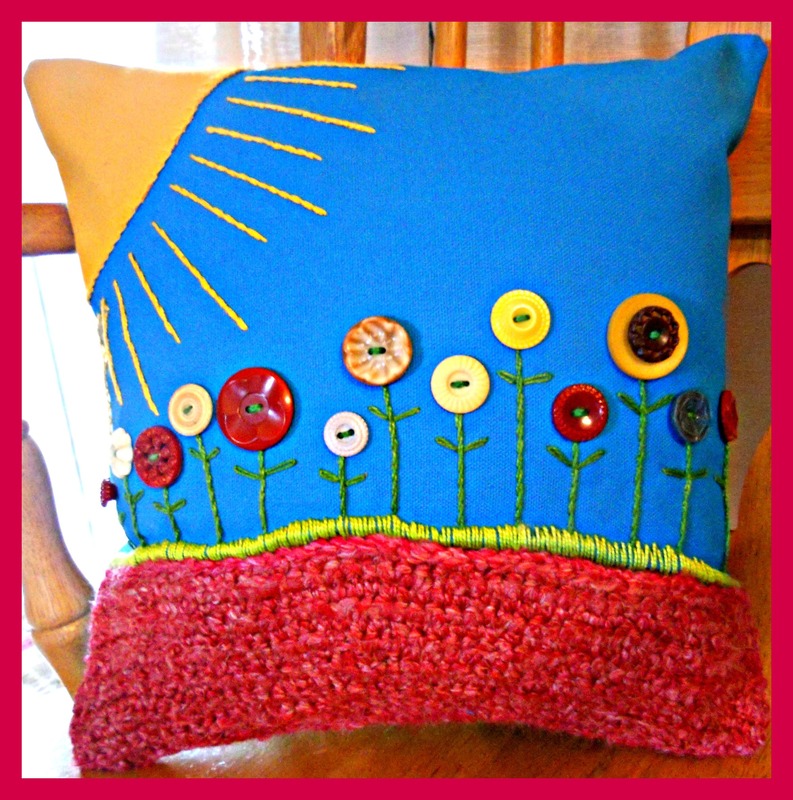 The pillow is perfect for spring and the crocheted red hill is great! Glad to see your first crochet project, looks great !! now a rug? lol I love your pillow, a wonderful project as always !! Maybe a dishcloth first (that turns out the right shape!) . . . then a rug! 🙂 Thanks, Liz! I love what you did with this! It’s bright & cheerful & downright gorgeous! this is truly a lucky save Katherine; it looks fun and it’s a great way to start your spring decor with these pops of color! I simply love how creative you are…to take something that wasn’t going as planned and make something lovely out of it…wonderful! My attempts at crocheting are wonky as well!! A marvellous save indeed! Absolutely gorgeous. That is the most clever recycle!Something to enjoy ! What an adorable pillow! I love it & the story behind it! Love the pillow; so cheery! Brilliant idea to turn it into a pillow! I love the way you think outside the box! Awesome!!! You bet! You’re the queen of “Making do” or Making something new again! Crochet???? You can be very proud!! You did a great job for some one who doesn’t know how to crochet. The colors and composition are perfect, you created an amazing picture – I love it. I love it when “mistakes” turn out to be so beautiful! Great job! I’m working on a crazy furry pillow made from the yarn of an un-raveled good will sweater. It’s knitted, I’ll probably post a pic if I can ever finish it! What a lovely pillow! I love the bright colors and how you successfully combined different textures together. That pillow is perfect. I love the colors! This is an adorable pillow! Perfect for a sunny summer. Love how a project starts out one way and takes a total turn around before coming to rest! So glad you saved your first crochet attempt, if you hadn’t pointed out your flaws I would have never known about them on this pillow. It really does bring thoughts of spring. 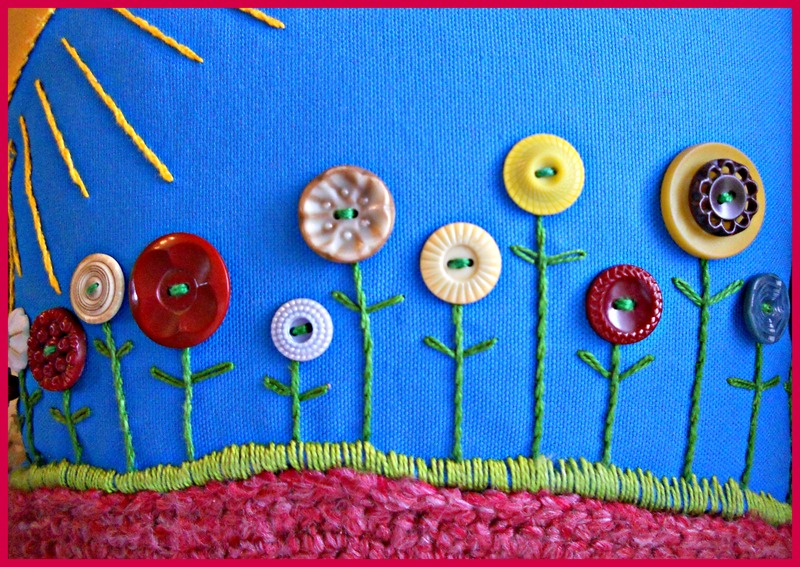 love it!…those cute little button flowers…Spring has sprung! Those buttons are gorgeous! I would want them in my collection of they didn’t look good where they are! Great way to use a first attempt at a new skill too. That came really nice and the colors WOW!!! oh mY! Katherine! what a beautiful work! I love everything about this pillow 🙂 and I love the way you used your first crochet project (congrats for learning, you will be hooked!) can’t wait to see what you ‘ll crochet next! What a creative use of everything. You made lemonade with this pillow. Great job! As a teacher of crochet, I applaud you! No one would ever suspect the arch was ever meant to be anything other than an arch. It looks great! I love it, so beautiful and colorful !! I’ll bet you could do it! Just crochet something wonky, and the sewing is just straight lines. 🙂 And don’t you just love buttons??? P.S. Your jewelry is gorgeous! I probably could sew and crochet…it’s just finding the time! 🙂 And thanks for the compliment! I could never do this. Never ever. And that “Wonky arch”? I never would have noticed. But I think the vision you created with your “mistake” is great. Cheery and colorful and perfect for spring. Wow! I absolutely love this Katherine!! Love the crochet red dirt and love the vintage buttons. Great combination! I still have my first attempt at crocheting….a scarf that turned into a long skinny triangle 🙂 Maybe someday I’ll lucky save it into a pillow. I love how yours turned out! I love the cushion, the colours make it look like the sunniest, happiest day ever. Keep going with the crochet, I’m new to it too but when you get going it’s a bit addictive. Thank you, I’m just starting out, so hopefully will see a lot of you in the blogosphere. Oops, I forgot the “to”. I hate when I do that. 🙂 P.S. I love buttons, so the flowers are my favorite part! Fabulous cushion! How clever to rescue something not so good that way. I really like this. As a knitter I found crochet hard to learn and get used to. However now I think I like it more than knitting. It is so versatile and great for 3D projects. Also for sewing projects it is lovely as an edging. With knitting and crochet I think it is a matter of waiting for your brain to stop telling your fingers what to do …. if that makes sense! Your pillow makes me smile! I love the fun colors! It makes me happy! I think your crocheting (sp?) is perfect! How creative, Katherine! Love the buttons and the entire design. This pillow makes me smile! Oh! This is so beautiful. I LOVE using buttons as art. Great idea … great save! This is a great pillow. I have quite a collection of buttons and I have been trying to think of ideas for using them. I think this is something I can try. Very nice. Free Dress or Top Pattern! What can you make with a flannel shirt?